Sideroblastic anemia is a term used to describe a group of rare blood disorders characterized by the bone marrow's inability to manufacture normal red blood cells. Named for the Greek words for iron and germ, sideroblastic anemia is one of the principal types of iron-utilization anemia. Abnormal, iron-saturated red cells are present in the blood of people who have this disease. Although the iron circulates normally from the plasma to the bone marrow, where new red blood cells are created, it is not properly incorporated into new red blood cells. Sideroblastic anemia can be inherited, but the disease is usually acquired as a result of illness or exposure to toxic substances. Sideroblastic anemia is a disease of adults. The cause of sideroblastic anemia cannot always be identified. Drug toxicity, alcohol abuse, and lead poisoning are common causes of this condition. Blood tests are used to examine the appearance and other characteristics of red cells and to measure the amount of iron in the blood. Bone marrow biopsy is also used. Acquired sideroblastic anemia may be cured when the condition that causes it is treated or removed. If the cause of a patient's anemia cannot be determined, blood transfusions may be necessary. Medications are prescribed to stimulate excretion or excess iron that accumulates as a result of these transfusions. In rare instances, treatment with oral pyridoxine (a B-complex vitamin) benefits patients whose sideroblastic anemia was present at birth. This treatment improves the condition of some patients but does not cure the anemia. Sideroblastic anemia of unknown origin may lead to leukemia. It may take as long as 10 years for this disease progression to take place. Leukemia Society of America, Inc. 600 Third Ave., New York, NY 10016. (800) 955 4572. http://www.leukemia.org. refractory anemia characterized by the presence of sideroblasts in the bone marrow. a heterogeneous group of chronic normocytic or slightly macrocytic anemias characterized by decreased erythropoiesis. 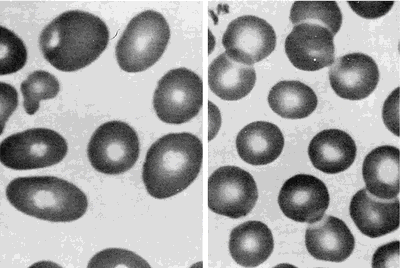 The red blood cells contain a perinuclear ring of iron-stained granules. Sideroblastic anemia is an acquired disorder and the cause is not understood. Treatment may include extract of liver, pyridoxine, folic acid, and blood transfusion. Also spelled sideroblastic anaemia. Compare iron deficiency anemia, siderosis. X-linked sideroblastic anemia with ataxia is a mitochondrial disease caused by a mutation in the nuclear genome. The loss of FTX in FRDA and GLRX5 in pyridoxine-unresponsive sideroblastic anemia causes deficiency in ISCs as in the myopathy associated with ISCU 1 defect. Mitochondria] ferritin expression in erythroid cells from patients with sideroblastic anemia. Familial-skewed X-chromosome inactivation as a predisposing factor for late-onset X-linked sideroblastic anemia in carrier females. It is increased in iron overload, hemochromatosis, thalassemia, sideroblastic anemia, and acute iron poisoning. Sideroblastic anemia Hereditary atransferrinemia Porphyria cutanea tarda Neonatal hemochromatosis Transfusional iron overload African iron overload [beta]-Thalassemia Postportocaval shunt X-linked iron-loading anemia Chronic hemodialysis Pyridoxine-responsive anemia Medicinal iron overload Pyruvate kinase deficiency Table 2. Differential diagnosis is usually straightforward but may include genetic sideroblastic anemias, congenital dyserythropoietic anemias, and other conditions with high levels of HbF (such as juvenile myelomonocytic leukemia and aplastic anemia). Heme biosynthesis and its disorders: porphyrias and sideroblastic anemias.